Written by: KristaG on March 14, 2016. For those that don’t know, today is Pi Day! What is Pi Day, you ask? It is a celebration of the mathematical constant – the ratio of a circle’s circumference to its diameter in this particular instance – known as Pi (π). Pi is often represented by the number 3.14, but the actual number has been calculated out to over one trillion (1,000,000,000,000) digits past its decimal point. Pi Day is celebrated in various locations around the globe on 3/14 of every year in recognition of the first three significant digits (3, 1, and 4) of π. The first large-scale celebration was hosted in San Francisco, CA in 1988 at the Exploratorium, where many festivities are still held every year. I, sadly, have to work on Pi Day, so I’m missing out on a good portion of the day’s festivities – local and abroad. However, as soon as my shift is over, I fully intend to participate with sharing pies with my friends, loved ones, and you! Below are some of my chosen recipes for my contributions to the menu for our Pi Day Pie Party – not all of them are for dessert! 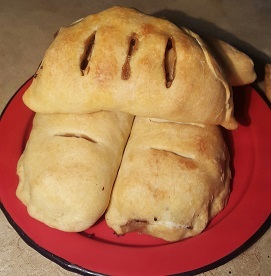 Two years ago, I was surprised with these wonderful meat hand pies for our St. Patrick’s dinner with friends. They are surprisingly easy to make and are great when cooking for a crowd (this recipe serves 8)! I can hardly wait to have these for dinner again! These Irish Pasties are amazing!!! So yummy! Combine flour and salt in a large bowl. Cut in butter and cream cheese with two forks until mixture resembles coarse meal. Add egg, water, and vinegar and work the mixture until it forms dough. Transfer dough to lightly floured board and knead for approx. 5 minutes, working in more flour if dough is sticky. Wrap in plastic wrap and refrigerate for at least 1 hour. Heat oil in large saucepan over medium low heat. Add onion and sauté about 5 min until tender. Increase heat to medium and add meat. Sauté until browned on all sides (~3 min). Season with salt, pepper, and oregano. Stir. Add carrots and potatoes then sauté ~10 min. Add whiskey and stir until mixture cooks down. Add sour cream, Worcestershire and Dijon. Stir until well incorporated and remove from heat. Allow to cool. Divide into 8 equal portions. Roll each portion of dough into 7” squares. Place filling in the middle of each square and pull up edges to seal ends together. Flatten sealed ends over filling then turn over and push filling towards center, flattening edges. Trim if needed to create straight edges then use a fork to crimp closed. Place on baking sheet and brush with egg wash. Create 2-3 small slits on top of each pie. Bake 25-30 min or until golden brown. Serve warm or room temp. 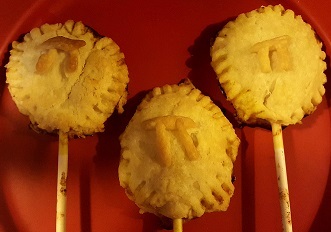 I stumbled across this recipe a few years ago over at Munchkin Munchies and am thrilled to have been able to find it again in time for Pi Day! These “fries” can be made using a premade pie crust or by using your favorite homemade pie crust. 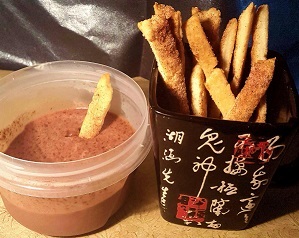 Pie Crust “Fries” with chocolate pie filling. I also made blueberry, but it was all eaten before I got to snap a picture! Mix cinnamon with sugar and set aside. Cut pie crust into strips – you can use a knife, pinking shears, or a fluted pastry wheel depending on the appearance you want your fries to have – and lay them onto a foil covered baking sheet. Brush the strips with melted butter. Sprinkle with cinnamon and sugar (optional). Bake at 375 degrees for 12-15 minutes. These “fries” are great on their own or with dips. Munchkin Munchies recommends using jams as a dip to dunk these “fries” in, but I tend to make a little extra pie filling just so I can have my own dips and they are a little more “pie” like. My favorites to use are apple, blueberry, or chocolate. These are great for large groups! I have been incredibly lucky to have come across a Pie Bites Press from Nordic Ware which makes creating these a cinch! If you don’t have one, that’s okay. I’ve also used dumpling presses (which create more of a crescent or half-moon shape), woven lattice circles for apple pie pops and just pressed them together with a fork, and just used my fingers. Any of the techniques used for pressing closed a double shelled pie will work just fine! The recipe below makes 18 pie pops. If using a pie pop press, cut the dough into 2.25” circles. Repeat until there are 36 circles. If using a dumpling press, cut the dough to the diameter of the press you are using. Repeat until there are 18 circles. If using a hands only method, I recommend cutting them to 2.5” circles. Repeat until there are 36 circles. Place a dough round into the press being used. Place one T of pie filling in the center of each circle. Brush edges with egg wash. If using a hands only method or pie pop press, place a lollipop stick in each pop so that the stick is in the center of the filling. If using a dumpling press, press the pop closed before inserting the stick afterwards. Cover with another dough circle (if not using a dumpling press). Seal the edges by either pressing the pie pop press closed or with a fork. Place pie pops on a baking sheet covered in parchment paper. Brush with egg wash, if desired. Bake for 12-16 minutes, until lightly golden brown. Repeat this process until all pops have been made. Looking for other recipes to consider? Fellow Geek Girl Project authors, Rebecca, Emma, and Jenn have great recipes for a quiche, chicken pot pie, shepherd’s pie, and even a strawberry pie that can be made in a mug using the microwave available to check out as well! I hope you enjoy these recipes and please feel free to share your own with us in the comments or send us a message! Happy Pi Day everyone!